Keep it simple young man. A lot of young men, when they first decide to start dressing well, go out and invest in fancy, expensive items that are much nicer and much more formal than everything else in their outfits. That’s not a good way to start! You spend a lot of money, and you end up with an awkward mish-mash of high fashion and low fashion; of business formality and casual street wear. Take your cues from your environment and from what you already own. Unless you’ve been totally clueless all your life, odds are that your current wardrobe is at least practical for your surroundings. Your task is to upgrade, not to replace. Look for basic, sturdy pieces of clothing at a slightly higher standard of dress than the ones you’re currently wearing. Avoid items that look like nothing you’ve ever worn before. 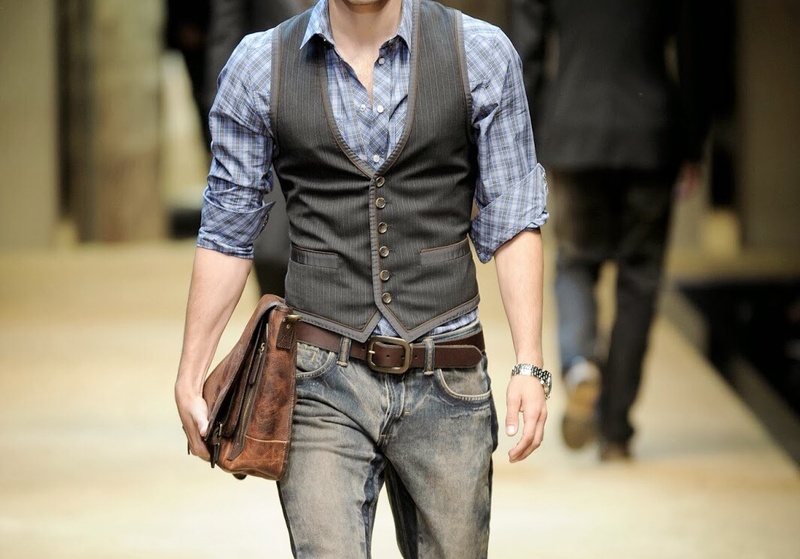 And definitely avoid mixing business and formal clothing with casual garments! Finally, be realistic about your environment. A three-piece wool suit is a nice outfit, but if you’re wearing it in Texas in the summer, you’re not going to look sharp. You’re going to look flushed, sweaty, and uncomfortable. Don’t let fashion eclipse your body’s needs — because your body certainly won’t. This is basic, practical advice for your wallet. Thrift stores are an amazing place to start building a wardrobe for a fraction of the cost that you’d spend buying new. But getting to know your local consignment and charity stores is also educational. You’ll be dealing with a mixed bag of styles. Some will be simple and timeless; others will be last decade’s fleeting trends. Sorting the presentable from the comical is excellent practice for building your own unique style. Not everything old and out-of-date is necessarily unwearable. A good, simple outfit of timeless clothing with one funky period piece thrown in there is fun. It shows people that you know what the rules are, but also that you’re not afraid to break them when it looks good. Just take it easy, and focus first on buying clean, simple looks you can mix and match easily. And get used to it taking a while — not every trip to the thrift store yields results. If you need something that looks good fast, you’ll probably have to buy new. But when you’ve got time to kill, the thrift store (or relatives’ closets, with their permission) is the way to go. There’s a pretty cool story behind most your clothing. Most details on contemporary garments are there for a reason. In high fashion the reasons get somewhat arbitrary, but in basic, everyday menswear, the history is easy — and fun — to trace. For example, the high-up pocket placement on the breast of dress shirts and work shirts? That’s a tweak that goes all the way back to the days of hand-loaded, shoulder-fired muskets, when a pouch high up on the chest reduced the time it took to reload. The high breast pocket has been an American man’s look since the days of the Revolutionary War (actually – even farther back if you look!). Not all the historical details are military. Blue denim and blue chambray workshirts are classic colors because the indigo dye used to produce them was cheaper than bleach in the early 20th century, making it easier to re-dye blue clothes with work stains than to clean white ones. These are just examples. There’s a reason for most things in men’s style. Knowing them is fun, and it’s also an effective counter when someone gives you a hard time about your clothing choices. Locate someone who dresses well, and who is willing to give you a few tips. If they’re local, or a family member, that’s ideal, though in the age of the internet it’s not strictly necessary anymore. Performers and public figures, from rock stars on down to local politicians and teachers, are often more aware of their appearances and the clothing choices they’re making than the average man. Ask around. See who’s just throwing things on in the morning, and who’s making conscious choices. Spend some time looking around a really nice store. Browse through the racks. Handle the clothing. Try on a couple outfits (full outfits, not just individual pieces) that you like the look of. And then put it all back. Don’t break the budget. The point is to get a sense for what true quality looks and feels like. In the same way that aspiring artists visit museums to see the works of the old masters, you’re looking to see how men with much more experience and money dress well. It gives you an idea of what to look for when shopping in cheaper stores and thrift stores. You learn what good fabric should feel like against your hand, what a quality cut looks like, and so on. That way, you’ll spot those rare, fantastic deals when you spot them. Just for example, a $400 suit may not sound like a cheap price to a casual shopper, especially one on a budget. But if you recognize that the suit’s made from an extremely fine and expensive tropical weight wool that usually retails for thousands of dollars, and that it’s being made to measure in your size by a talented tailor, and that it will fill a need in your wardrobe for the next decade or so — suddenly it becomes a pretty good bargain, even if it means being a little tight on cash for a month or two. Seriously, spend some time with a needle and thread. Get over any issues you have with the “masculinity” of it. Most of the master tailors in the world right now are men. More importantly, it’s a real time and money saver. If you don’t have even the most basic skills, you’re looking at ten bucks to sew a button on your shirt; twenty-five to get your pants hemmed. In terms of labor costs, that’s on a par with doctors and specialized mechanics. Save yourself the money by learning to do it yourself. It’s not hard — and, if you’re a younger man in college or a large house with lots of other guys, you can start charging those ten bucks here, twenty bucks there, sorts of rates to fix you buddies’ clothing up. It’s good practice for you, money in your pocket, and the comforting knowledge that you’ll never be dependent on finding a tailor for some quick repairs when you travel. A final tip for young men: teach other young men! That doesn’t have to be formal. Just talk about clothes, go thrift shopping with other guys, or spend some time answering questions on a menswear web forum. The more you think about how to advice other people, the more you’re thinking about advice that holds true for you, too. It’s widely acknowledged that to demonstrate mastery in a skill, the practitioner has to be able to effectively instruct someone else in the skill. If you’re not there yet with fashion and wardrobe-building, don’t sweat it — but do aim for it. You’ll know you’re a sharp dresser when other guys are coming to you for help, and you’re providing it without even thinking hard.